Information about The Morton family in Kirkby Malzeard /Grewelthorpe/ Masham/ Ripon area. Report in Newspaper [Huddersfield Chronicle] in 1860. Death by Drowning at Hackfall. A melancholy case of drowning whilst bathing occurred in the Hackfall grounds on Friday afternoon last week. A young man of the name of Morton, about 21 years of age, and son of the late W.Morton ,of Kirkby Malzeard, Farmer. together with his Mother and Sister and another young man, went to spend the day at Hackfall. The Mother and her daughter stayed at Hackfall House, whilst the young men rambled thro the grounds. It appears that they had sat down at the riverside, and the friend had fallen asleep whilst Morton had gone into the water. A person was fishing at a short distance and saw him struggling in the water, and ran for assistance, which arrived to late to be of service. Morton’s friend was still asleep at the return of the party. It would seem that this young man was Frederick Morton born C1839 the son of William Morton. Farmer at Kirkby Malzeard. The rest of the family according to the 1841 census was. Other Morton’s in the area. ANNE MORTON. Born 3 Nov 1783 Masham. Died 28 Feb 1864. Dau of William & Elizabeth Myers. Married Dr. Samuel Russell. of Ripley. on 17 Dec. 1807 in Masham. ANNE MORTON. Born C1836 Ripon. Dau of Henry [seed merchant] & Anne. ANNIE MORTON. Born C1897 Masham. Grand daughter of William Pickersgill of Masham. [Ref 1911 census]. CHARLES MORTON. Born C 1842 Ripon. Son of Henry [seed merchant] & Anne. EDWARD MORTON. Bap.21 Nov 1842. Buried 23.Nov 1842 Kirkby Malzeard. Son of Henry & Anne Morton. ELEANOR Y.MORTON. Born C 1864 Masham. In 1901 she was a mission secretary in Essex with possibly her sister Margaret. ELIZABETH HANNAH MORTON. Born Sept. 1848 Bedale. Died 15 Sept 1873 Bedale. Dau of Matthew [innkeeper] * Sarah Pearson. EVELYN MORTON. Born C 1900 Masham. Dau of Wm. Fred [Railway worker] & Annie. GEORGE Morton. Born 27 July 1778 Masham. Died 1851. Son of William & Elizabeth Myers. GEORGE HARCOURT MORTON. Born c 1851. Ripon. Son of Henry [seed merchant] & Anne. HARCOURT LANCELOT MORTON.[Major]. Born 1785 Swinton Masham. Died 1854 Bedale. Son of William & Elizabeth Myers. Married Martha Gammell of London. HARRY MORTON. Born C 1841 Ripon. Son of Henry [seed merchant] & Anne. HARRY MORTON. Born C1890 Masham. Son of William Fred [railway worker] & Annie. HENRY MORTON. Born C 1808 Masham. Seed and Spirit merchant in 1851 in Ripon. Married to Anne of Ripon. In 1891 Henry was a Land Agent & J.P. living at South Lodge. Ripon. he was a widower, with his 2 unmarried daughters. HENRY MORTON. Born C1839 Winchester. Watch & Clockmaker in Masham in 1881. Married to Mary E. from Cambridgeshire. ISABELLA G. MORTON. Born C Ripon. Dau of Henry [seed merchant] & Anne. JOHN THOMAS MORTON. Born C1851 Bedale. Son of Matthew [Inn keeper] & Sarah Pearson. MARGARET MORTON. Born C 1862 Masham. In 1901 she was a Mission Secretary in Essex. possibly with her sister Eleanor. MARY MORTON. Born 1782 Swinton Masham. Died October 1857 Sheffield. Dau of William & Elizabeth Myers. Married Charles Pickslay. MARY MORTON. Born C1839 Ripon. Dau of Henry [seed merchant] & Anne. MARY MORTON. Born 1853 Bedale. Died June 1884 Deighton. Dau of Matthew [innkeeper] & Sarah Pearson. MARY MORTON. Born C1854 Bedale. Dau of Matthew [innkeeper] & Sarah Pearson. MARY EMMA MORTON. Born C 1893 Masham. Dau of William Fred [railway worker] & Annie. MARTHA MORTON. Born C 1790 London. Living a widow in Masham in 1861. MATTHEW MORTON. Born 1811 Derbyshire. Died 1877 Bedale. Married Sarah Pearson. of Bedale. 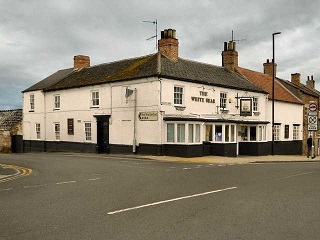 1871 Census: Matthew is innkeeper at The White Bear Inn, Bedale. MATTHEW JAMES MORTON. Born C 1856 Bedale. Son of Matthew [innkeeper] & Sarah Pearson. ROSE MORTON. Born C 1889 Masham. Dau of William F. [railway worker] & Annie. TOM MORTON. Born C 1844 Ripon. Son of Henry [seed merchant] & Anne. TOM MORTON. Born C1902 Masham. Son of Wm. Fred. & Annie. [Railway worker] Living at Station in Masham in 1911. WILLIAM MORTON. Born 10 Jan 1741 Babworth. Died 1782. Son of George & Anna Bingley. Married Elizabeth Myers of Masham. in Nov. 1775. Lived in Swinton Masham. WILLIAM MORTON. Born C1834 Ripon. Son of Henry [seed merchant] & Anne. WILLIAM FREDERICK MORTON. Born C 1861 Liverpool. Railway fireman. Living Masham in 1891. Married to Annie of Masham. Engine driver in 1901 still in Masham. Living Station House in 1911. Research started March 2018. If you can add any information please contact the site.